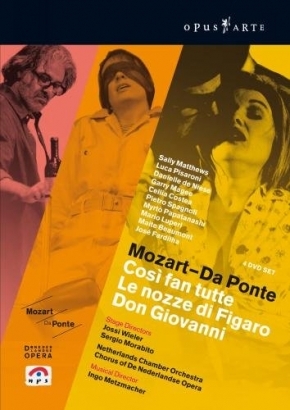 From Opus Arte comes this 4-piece DVD feature set containing four productions: Mozart and Da Ponte’s Cosi fan Tutte, Don Giovanni, and La Nozze de Figaro. Music is performed by the Netherlands Chamber Orchestra and accompanied by the Chorus of de Nederlandse. Key performances featured include Danielle de Niese, Sally Matthews, Luca Pisaroni, and Danny Magee. A must have for the Mozart enthusiast and afficionado.